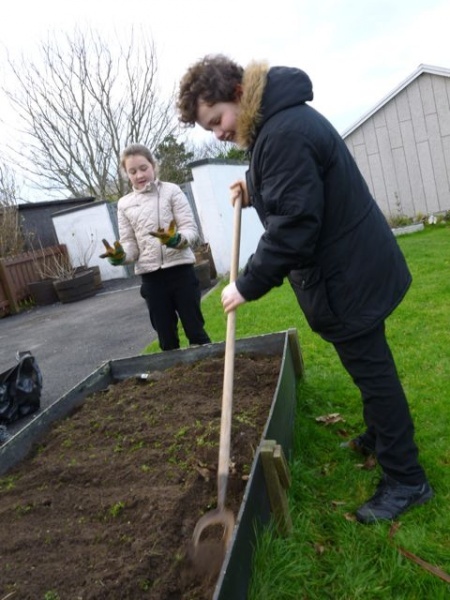 On Wednesday 19th November our class, (p7) went down to the front of the school where they cleared and tidied the raised beds ready for Winter. 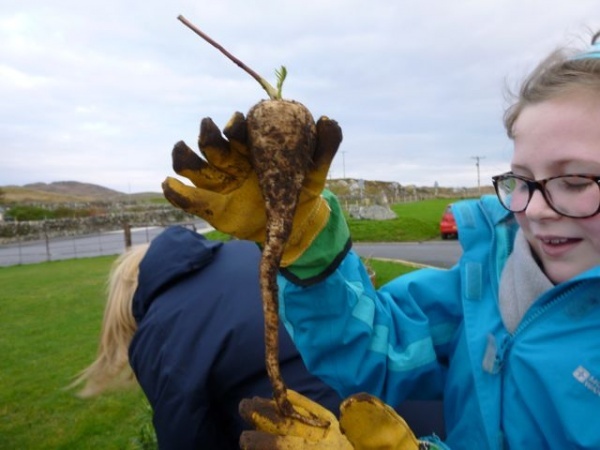 During the digging we pulled up lots of lovely parsnips which Emma will make into soup. Yum Yum! 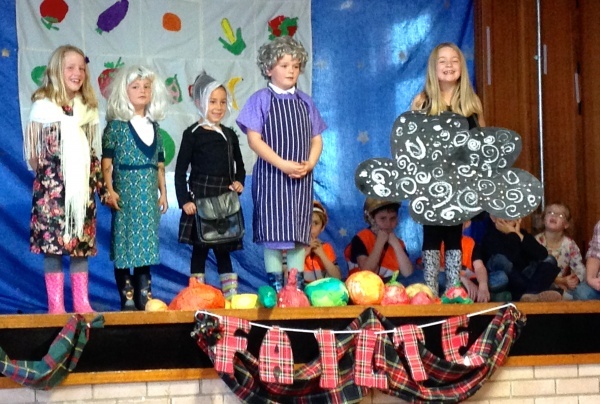 On Wedensday 8th October p3/4 held a harvest assembly for parents and the rest of the school to watch. A week before the harvest assembly we collected lots of harvest gifts for the old. We do this every year and everyone puts in a tin of food and lots of other things in. When all the food was collected they started their Harvest Assembly which was called the little black cloud. Ellen was the little black cloud. It was about a little black cloud who was trying to help by watering everything but everyone was unhappy but at the end the farmers needed the water for the plants and then the cloud was happy again. The moral of this story is that everyone has different points of view. It linked to harvest because when they watered the plants they could use the food as harvest food! We interviewed Abi and Jack they were very kind to let us do this. They both said that they were very nervous at first but they really enjoyed it in the end. Abi was a narrator which she was very good at and Jack was a builder and he was good as well. Yesterday we went to Port Charlotte Primary School to do some team games and bond with some of the P6/7s there. 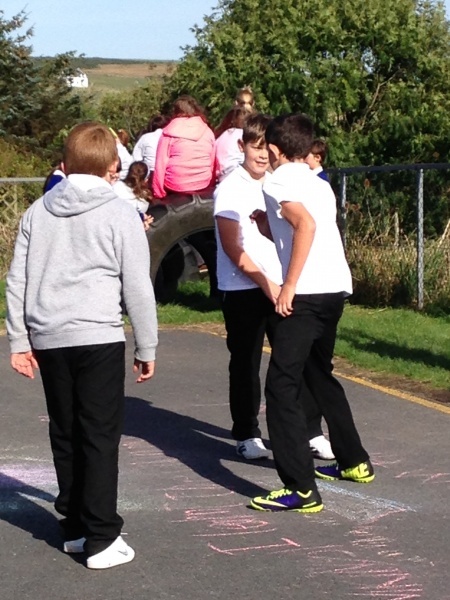 When we got there we had a chance to get to know the P6/7s better. After our long break we had lunch inside the school and went back out to have lunch break. Then at last we finally started team games, I was in a team with Annie, Jodie, Seumas and Mohit. We worked great as a group and won the game with 44 points. I had great fun and can’t wait to do something like that again. Fun Party- Fun for one and Fun for All!!!!!! On Monday was our hustings, each group took it in turn to come and present their party on front of the school. In the presentation was the party leaders speech, the groups power point and the video which told you about them and how they would help people.They also went round at breaks handing out stickers so people would vote for them. On Tuesday was the voting day where everyone in the school voted for who they thought would be the best. We set it up like a proper election, we had an electoral register, a ballot paper and everyone voted separately in the polling stations. This was all part of our election topic and to finish our election topic, we are going to write our captains speech and use as many techniques as possible. 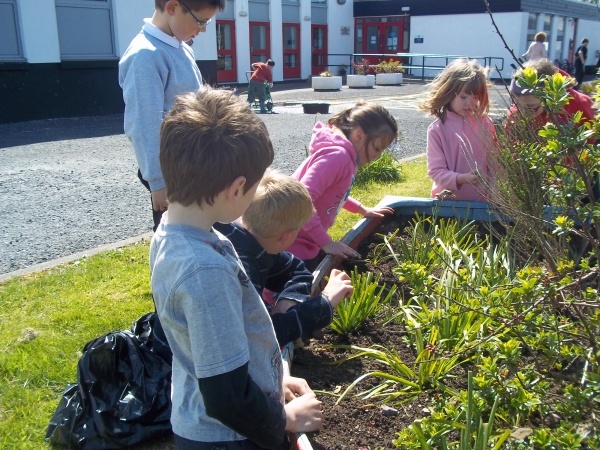 On Friday at Port Ellen Primary 1to5 have been gardening at the front of the school planting flowers in the old whiskey barrels and in the old boat, renovating it for the open day. At the end of May Port Ellen primary school’s pupils where informed that they had gotten their forth green flag! Now any one can see it on the flag pole out side of the school. Now Port Ellen is the only school on Islay with 4 green flags. Tagged with: eco, green flag. At school on a Friday afternoon P1-5 do gardening. People weed and some people plant!!! 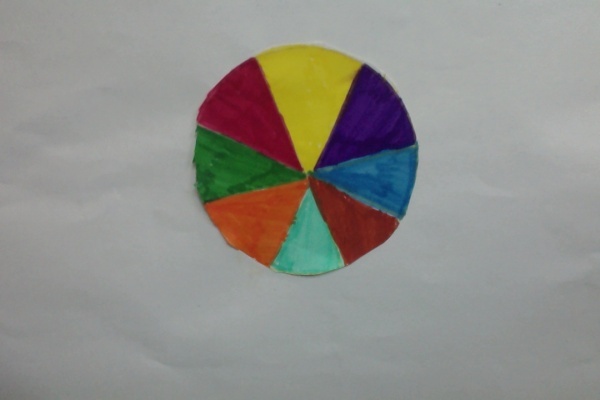 This month we had some very extrordinary news we had one our fourth green flag but we had some things we could maybe change but luckily it was not a lot the things we had to change were that we could maybe update our eco codes and get them in each classroom and not just the hall.